Greetings young pilot! 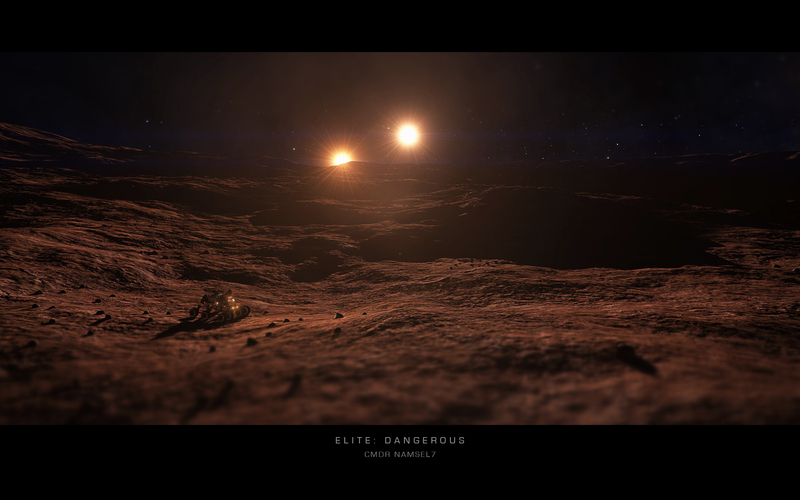 Today is your first day, we will introduce you to your new life on Elite: Dangerous. The simulation is complex and a helping hand to begin the adventure is something you cannot refuse. Some tutorials are available in-game to better handle the main controls; This guide will however be focused on a fresh start in the Live game. Elite: Dangerous is a sandbox, so it does not have an “ultimate goal”. 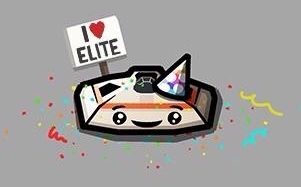 A vast content and a very rich universe makes Elite a world where everything is possible. 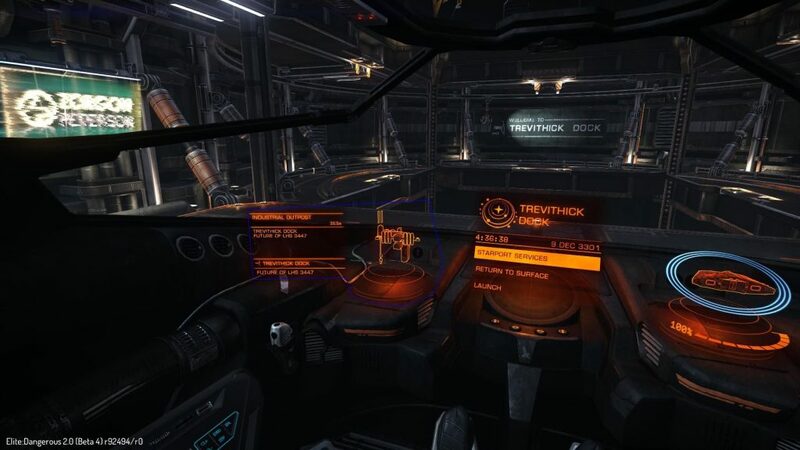 The player can become a small trader connecting two points of a short economic route, a dangerous pirate very well known or a powerful guardian of his faction or even a master smuggler able to pass the most forbidden or illicit resources anywhere in human space, who knows. The game is your game: choose your activity, set your goal and always push your thirst for stars, laser pew pews, glory or credits. 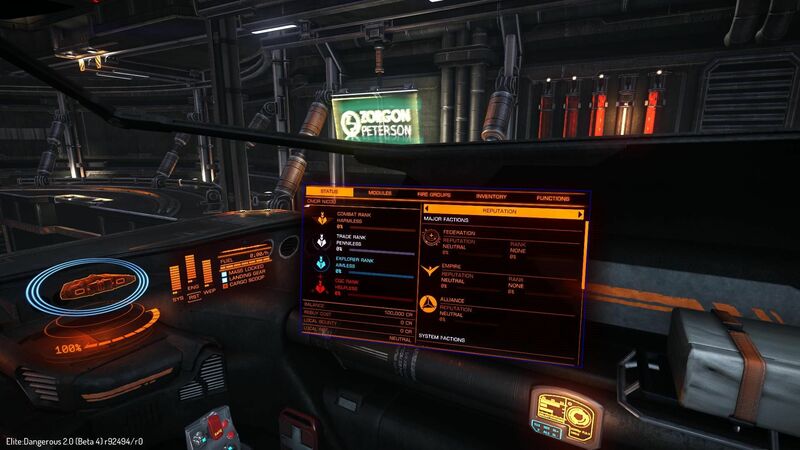 Let’s start fresh on a non-Horizons Sidewinder to learn basic controls, navigation and gameplay. 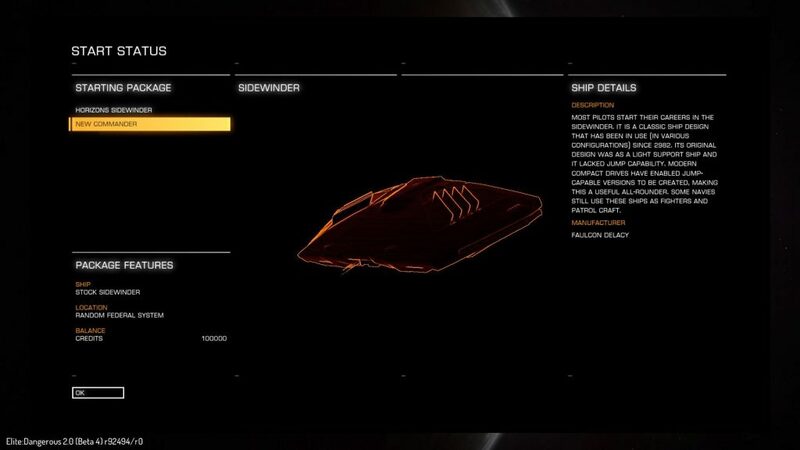 A brand new Sidewinder Mark I is offered to you as well as a handful of credits. This small vessel is not the nicest, nor the most efficient… but it is very cheap. 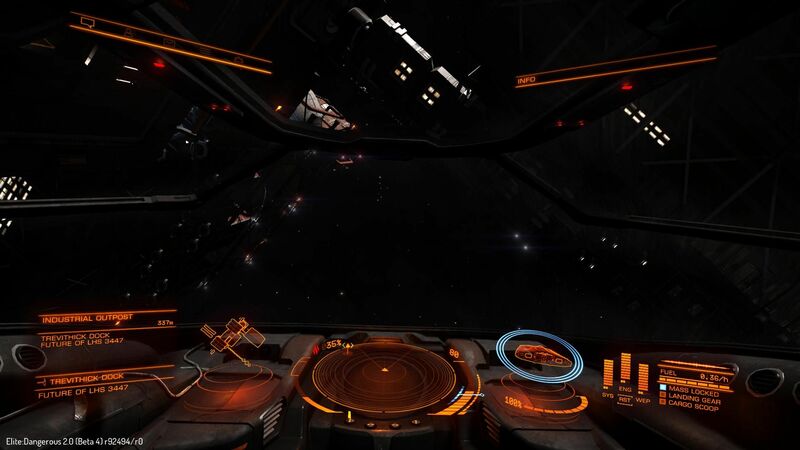 With some navigation training and completion of various missions, you should quickly be able to offer you something to match your talents and your role: the beginning of your great career! For example a Hauler (Transport/Exploration), Eagle (Combat), or even Adder (Multi-Role) if you are undecided about your second ship. Now, there’s a lot to know about piloting, inside panels & UI, modules, dashboard, communications… Let’s start with the basics. A middle click frees the view with your mouse. 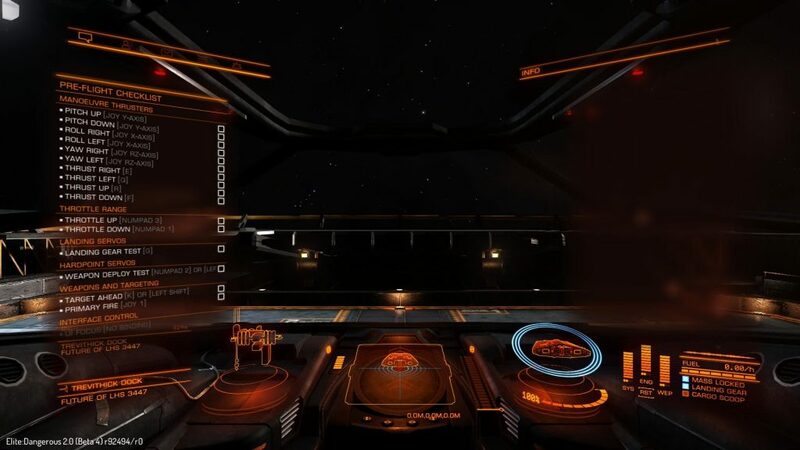 On your right, you will find your ship’s status and its shields (1) and hull (2), power distribution (3), thermal signature (4), fuel (5) and some deployments or mass lock (6). ▲ On your left panel you will find various tabs: Navigation, Transactions, Contacts, Subsystems, Inventory. 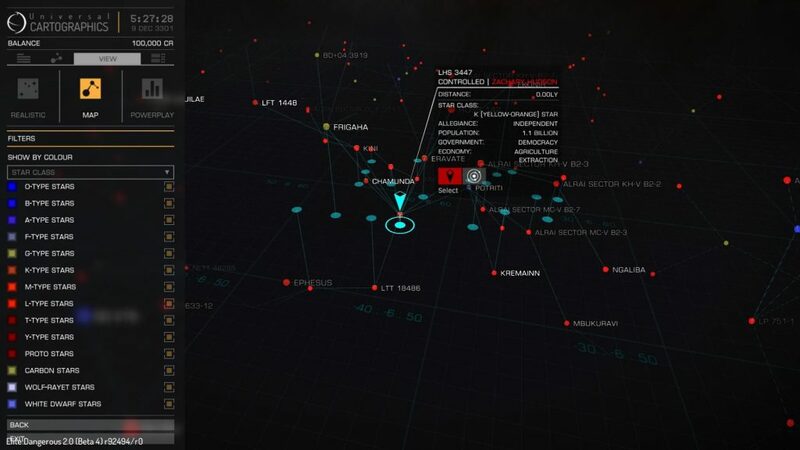 You can navigate to different points, check your missions and status, discover nearby contacts, target subsystems of a ship or analyse the ship’s cargo (with a special module). 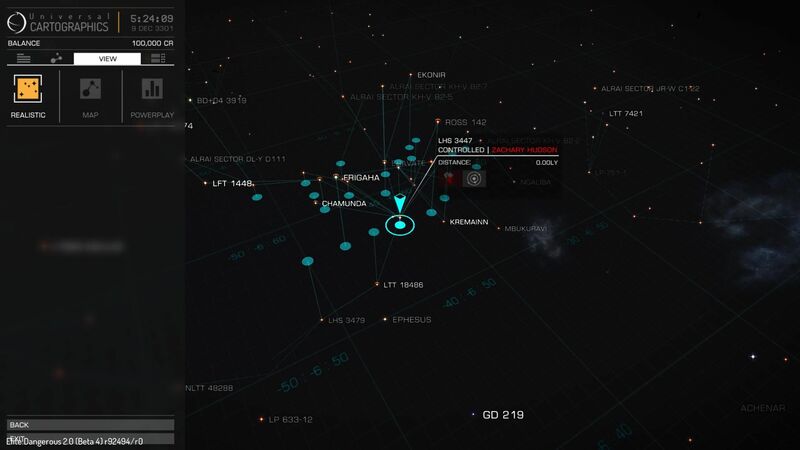 The first Navigation tab is widely used and allows among other things the use of the galaxy map, system map as well as obtaining the game’s news (Galnet) and a report on the Powers. 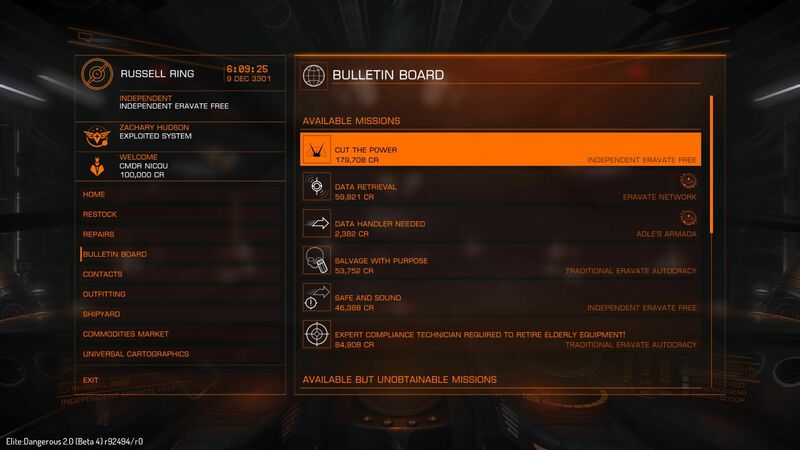 ▲ On your right panel you will find information about your ship: Status, Modules, Weapon Groups, Inventory, Functions. You can get a summary of your ranks, factions, reputations, your credits. 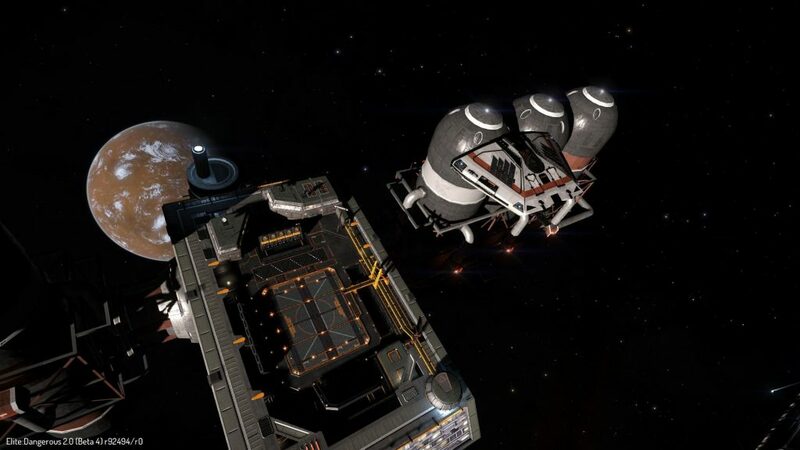 Next comes the Power Management & modules, then the Fire Groups to prepare the primary and secondary weapons for your ship, depending on your equipment. The inventory let you know what you are carrying, ie your freighter. You will also discover your materials as well as the synthesis to craft, refuel or repair various things. 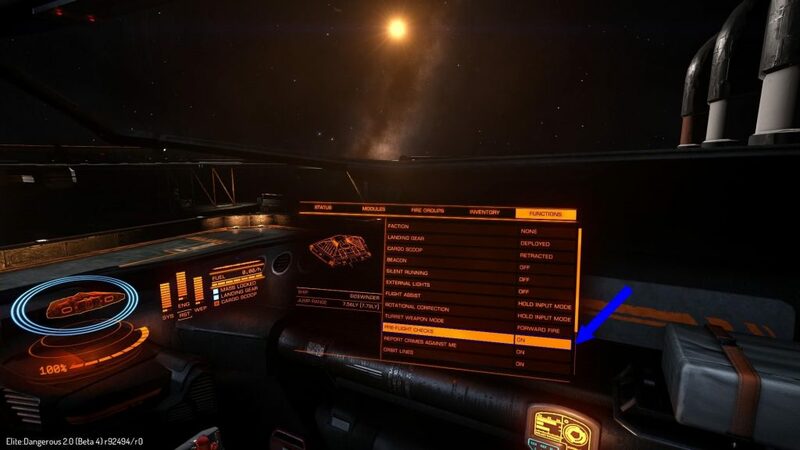 The functions tab allows you to set up your ship, choose the supported faction in the conflict zones and secure the Multicrew Fighters and Gunner. 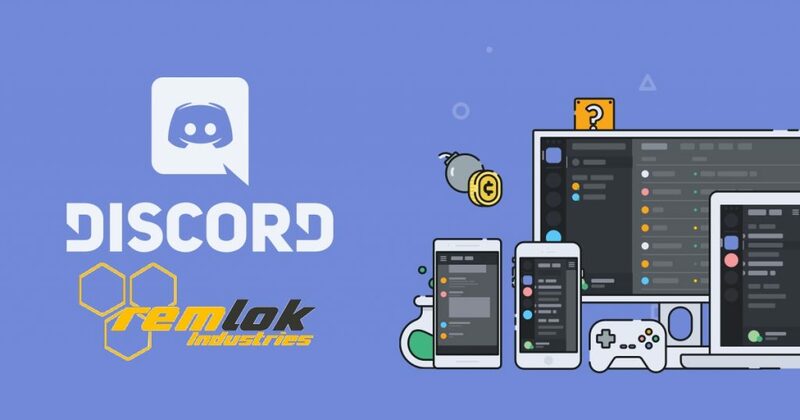 ▲ Top left, you can chat with the players and set up your communication. 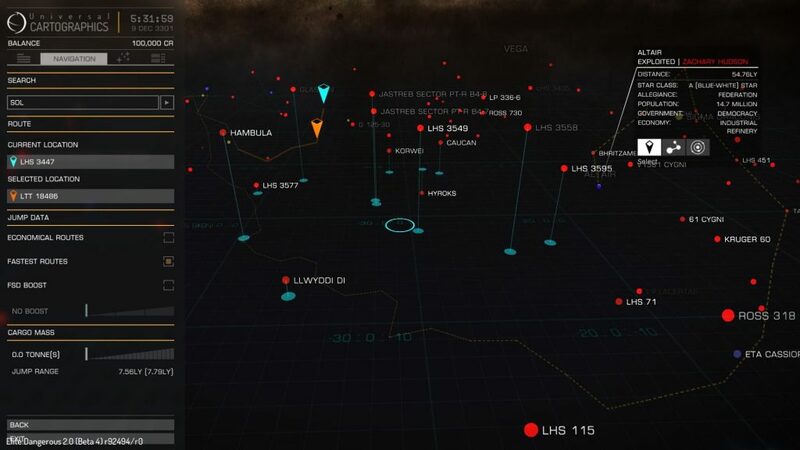 ▲ Bottom center, you get information about your ship and your SRV if you have the Season 2 Horizons. Well, you came here to fly right? So click on the second button in front of you “Return to surface” to see some stars and fly your spaceship. 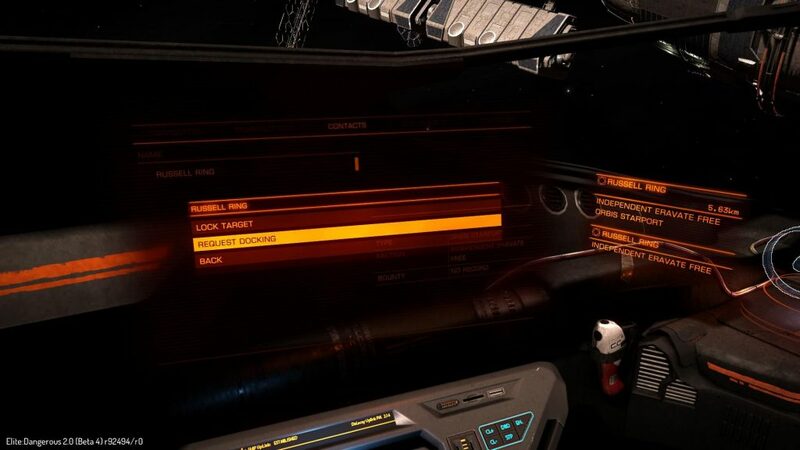 Before you start, it is imperative to check your controls, otherwise your adventure will be short: you do not play Elite: teddy bear, but Elite: Dangerous! I bet you don’t want to press a button that would eject you immediately in the interstellar vacuum? Then go to the right panel then “Functions”. Enable the Checklist mode to check your basic controls before departure… Then, smash dat Launch! The checklist will appear on the screen. Perform them in the right order and do not hesitate to change the controls (via your menu) so that they are suitable for you, your keyboard or other peripherals. Here you are, in your very own spaceship! No panic, elevate it a little with your vertical thrusters and keep the balance of your ship. We will learn about how to move in space. There are three Movement vectors used with your reactors and thrusters: Reactors are front and rear thrust, vertical thrusters, lateral thrusters. A perfect combination of these will make you a seasoned pilot. 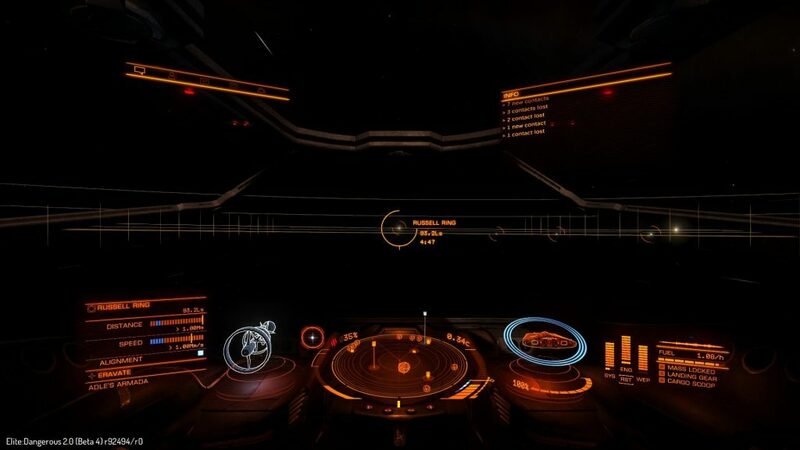 Fortunately, we are in 3301 and your on-board computer has a flight assist to stabilise your ship. It is possible to disable it but we advise against it for the moment. Start by retracting your landing gear and then go out side the station and play a little with these vectors. Then try to aim to the right or to the left with a combination of Yaw and Roll. You can raise or lower the nose of your ship by Pitching. In order to rotate effectively, make a yaw and then pitch the side where you want to turn, with a little thrust. 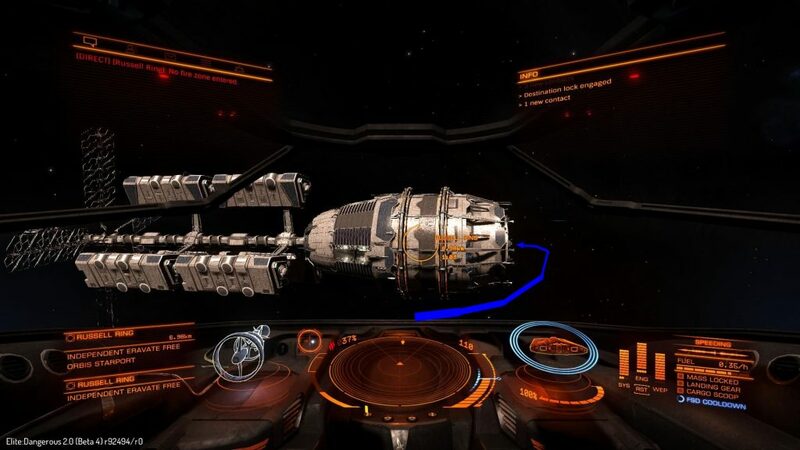 Note that it is advisable to stay in the blue zone speed to maneuver your ship efficiently, this is 50% of your speed. Don’t go above 25% speed while your take the hang of it. Now that you have mastered the basics, what should you do? No one can dictate what you have to do, this is your adventure! Oh… ok… Hey come on, I will not leave you in the vacuum of space, let’s look for a place to go ;). 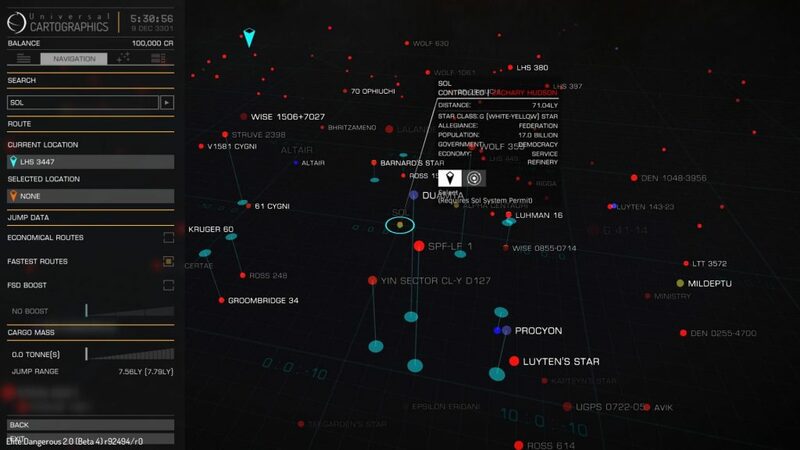 Go to the left panel and then “Galaxy map“. Oh wow it’s gigantic! Space is huge. We’re gunna make it great again. 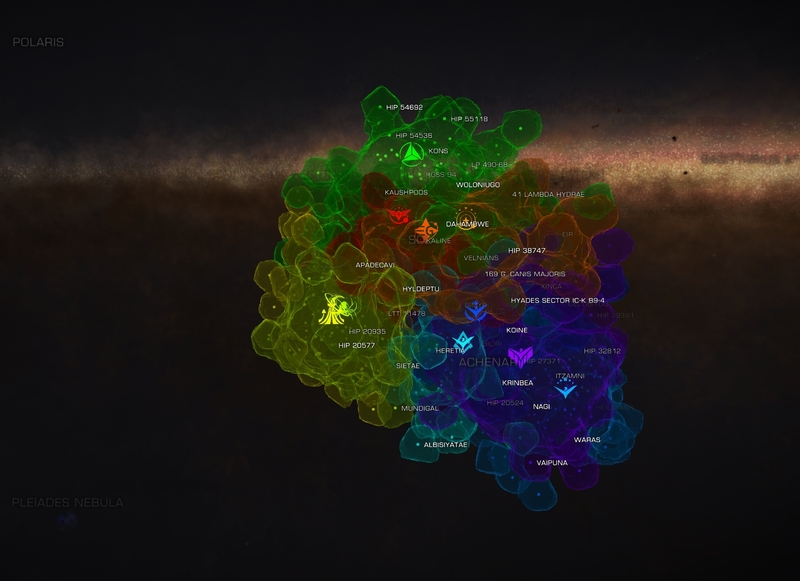 400 billion systems, all are explorable! Let’s check the inhabited human space for now, we call it “the bubble”. Let’s look at the class A star: “Altair”. 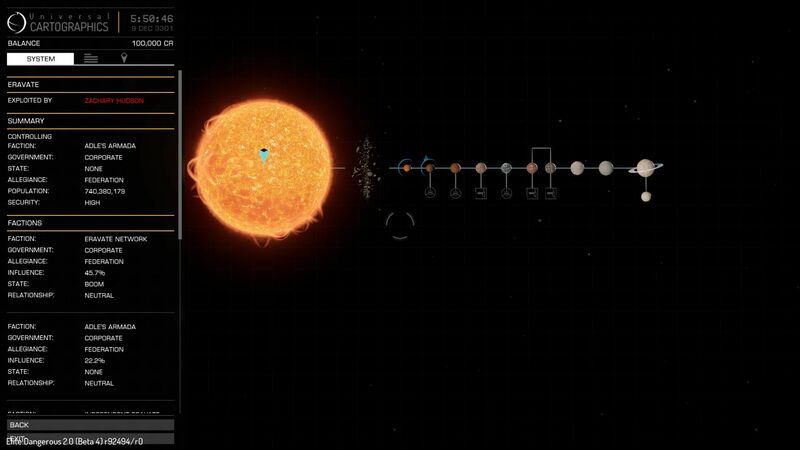 Ah, actually, your ship is not very effective at the moment: the orange line represents your route to reach your point of arrival. This depends on the jump distance available on your ship: currently 7.79 light years. 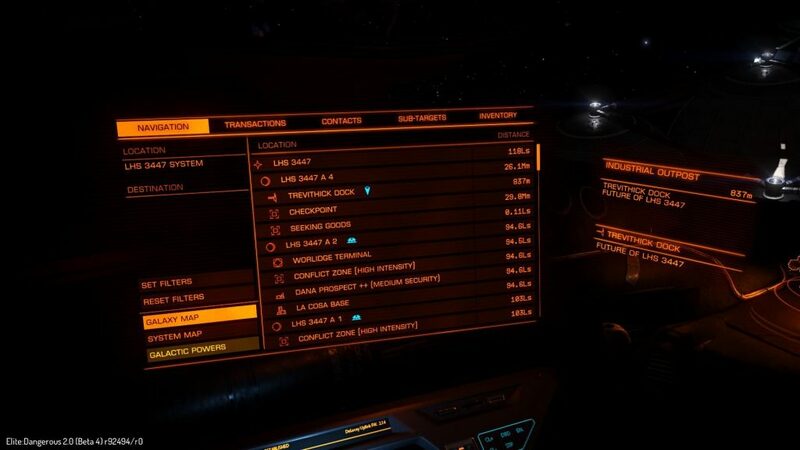 Depending on the ships, it is for example possible to get a 50 LY jump! Note that the boundary between the solid line and the dotted line represents the time when you will run out of fuel. 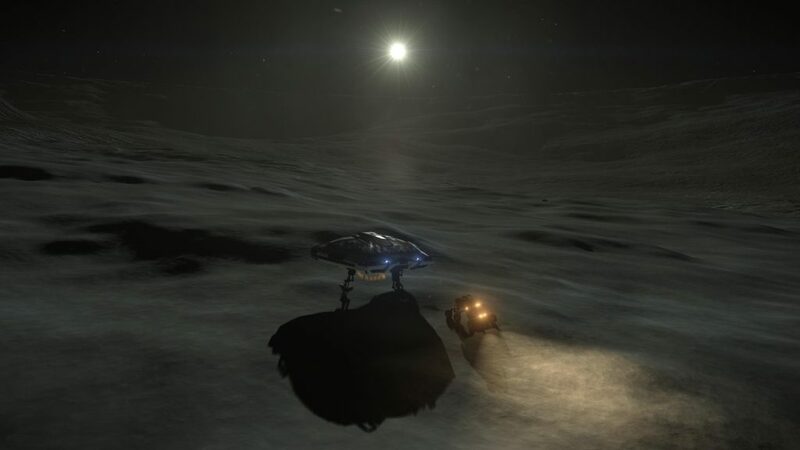 To replenish your fuel, you will have to stop at a station with this service or have a Fuel Scoop to drain fuel from a star that supplies it. 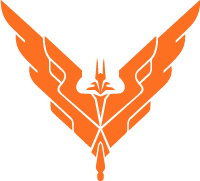 Let’s try something within our reach, for example the “Eravate” system. We can jump on that system and we have enough fuel to do that. Target this system and press the button indicated to prepare your route, the second one to plot the route. This done, return to your cockpit then notice your navigation indicator. If the white point is full, your destination is in front of you. You just need to center the point in the middle of this tool. 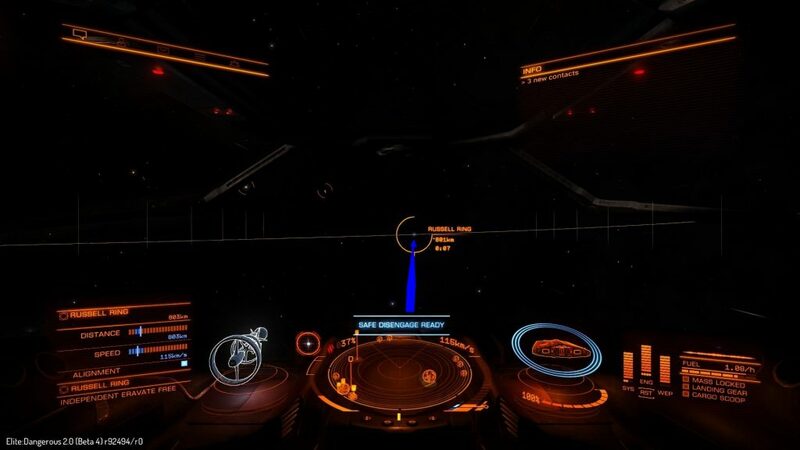 If the point is dark, the target is behind you. Bring the point straight to the center of your tool while moving at 50% speed, for increased maneuverability. Are you ready? Fasten your belt, because you are about to launch your first jump! Fly in a straight line at 100% speed, keeping the target at the center of your navigation indicator. Do not hesitate to use your Boost feature to reach this 100% quickly, if your line of sight is clear. 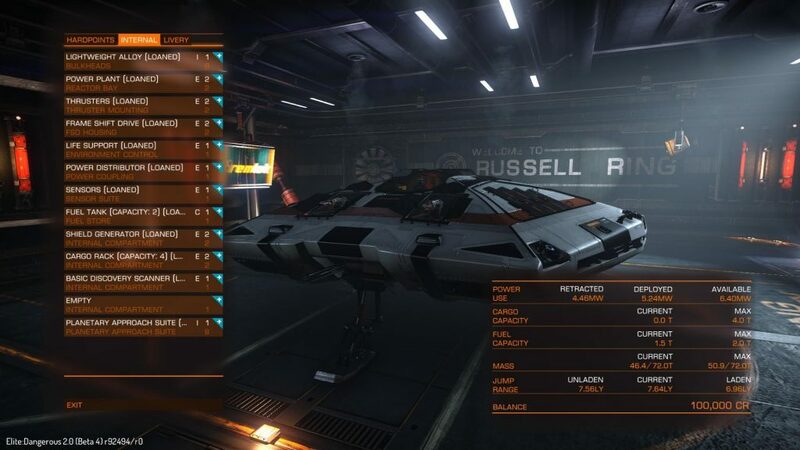 Use the options of your Power Distributor to put all the power on the center column: ENGines. 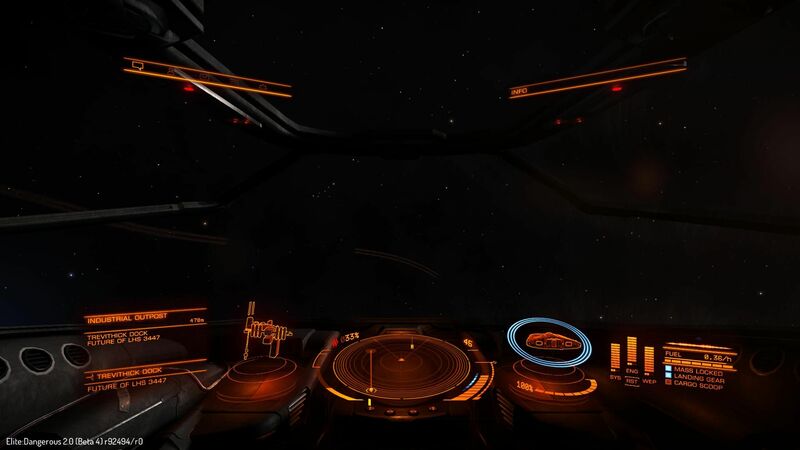 Note that the fuel that will be used for this jump is shown at the bottom right. The more you jump far away, the more fuel will be consumed. Activate your jump module to charge your FSD. Here we go! Note that the fuel used for this jump is displayed in blue. 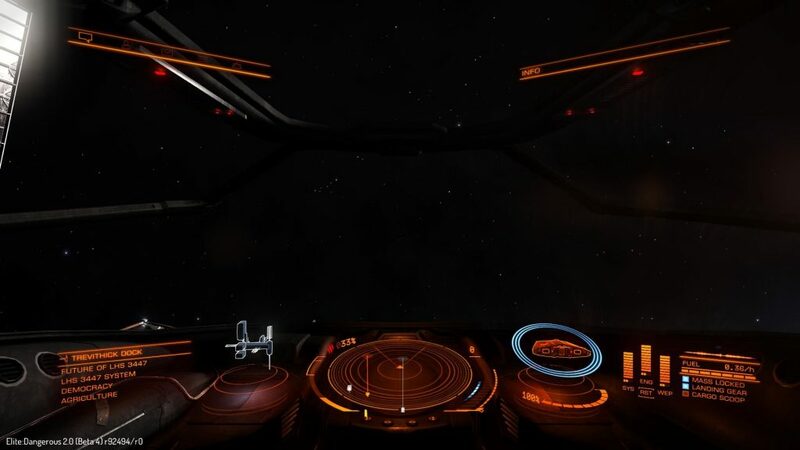 Once the jump is done, you will immediately be dropped from hyperspace near the star and fly in Supercruise. 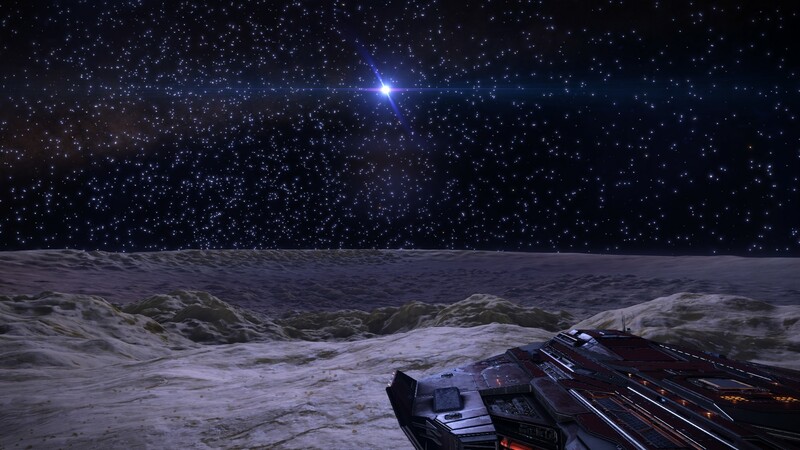 Move your ship away from this star by moving your ship in the opposite direction. The Supercruise is a much higher speed than standard navigation you’ve experienced before. This allows you to quickly reach the various points of a system. 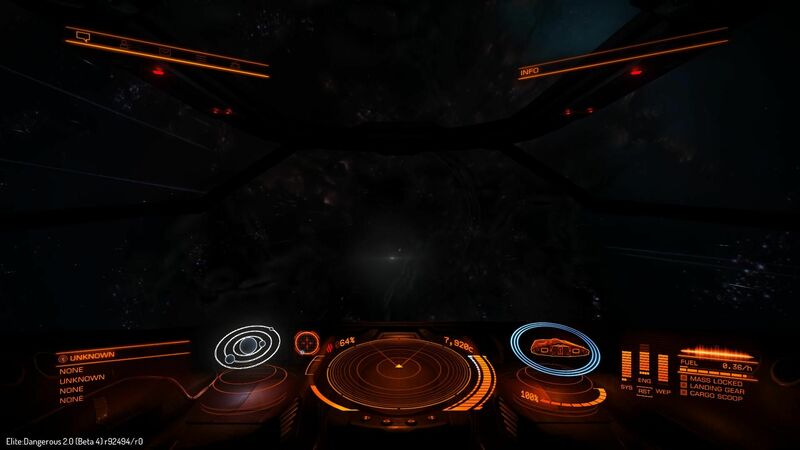 Take a look at your left panel, Navigation. Here, choose a station orbiting around a planet in order to rest a little. 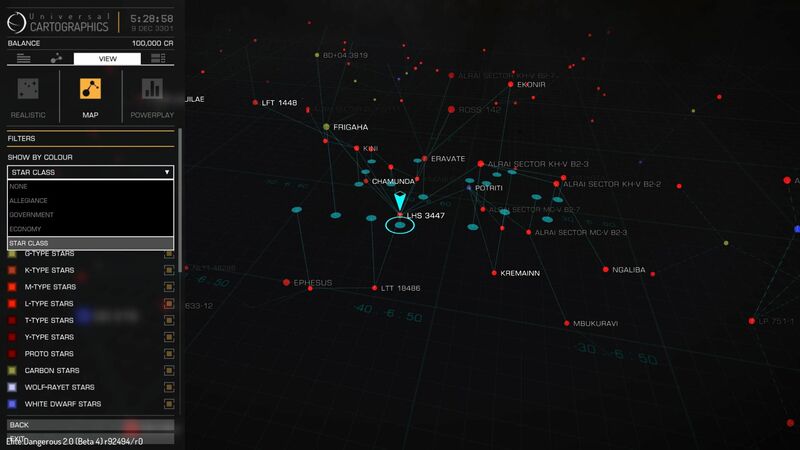 You can open the system map to discover Eravate. 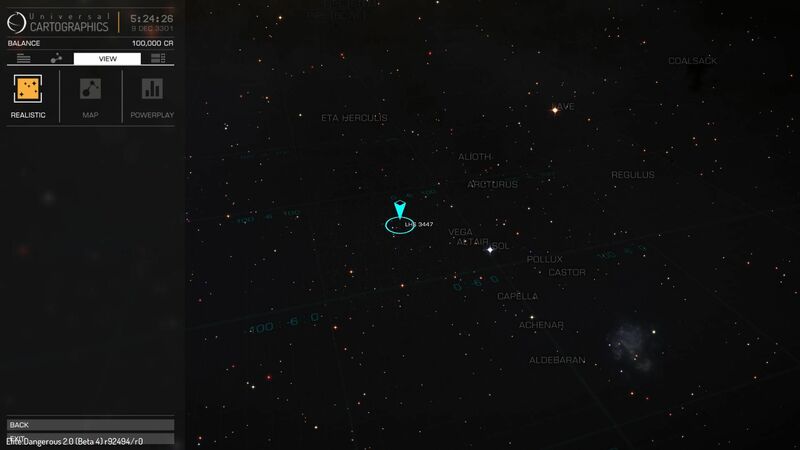 You will discover various planets of different types. 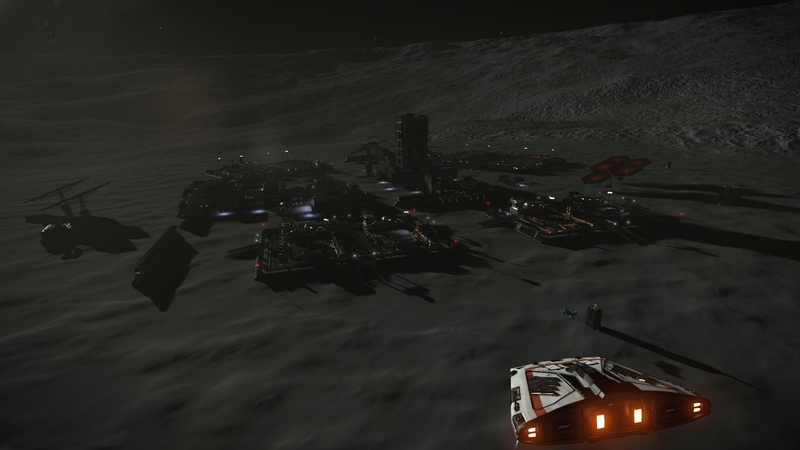 There are many stations and outposts here, all of which are controlled by different factions. You will find their list on the left, in the system map. 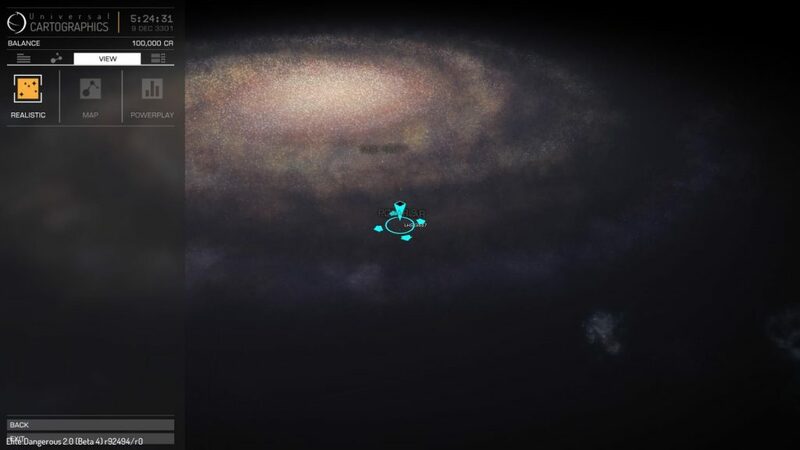 Note that an asteroid belt is also present, and that the last planet has rings. These contain minerals and metals that can be gathered by Miners. 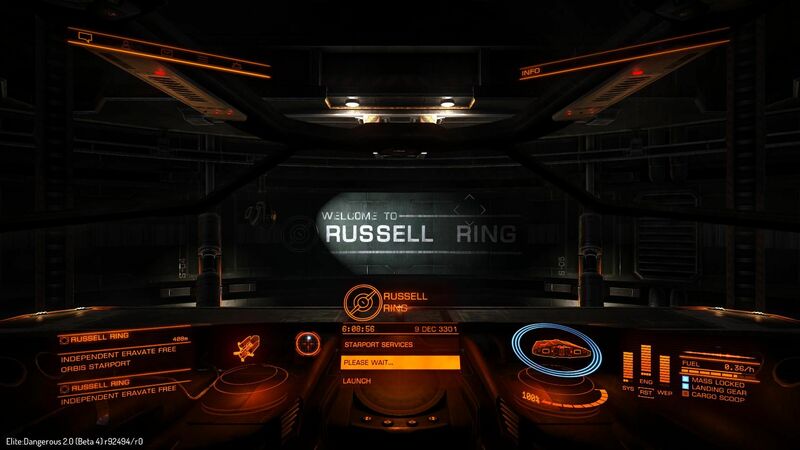 Look for Russel Ring station, then select it and exit the system map. The station is now targeted, get 100% speed while remaining in Supercruise. When approaching 6s to 7s of arrival time, reduce your speed to 75% so you will not overshoot it and go beyond your destination point, then approach the station in order to come from within the orbit. By doing so, you will arrive in front of the station’s entrance. 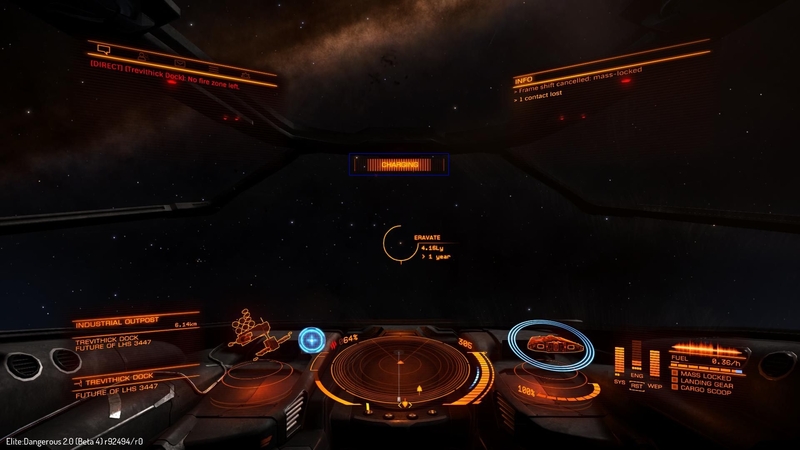 Exit supercruise at 1Mm (Mega Meter) when the game tells you that you can exit safely. 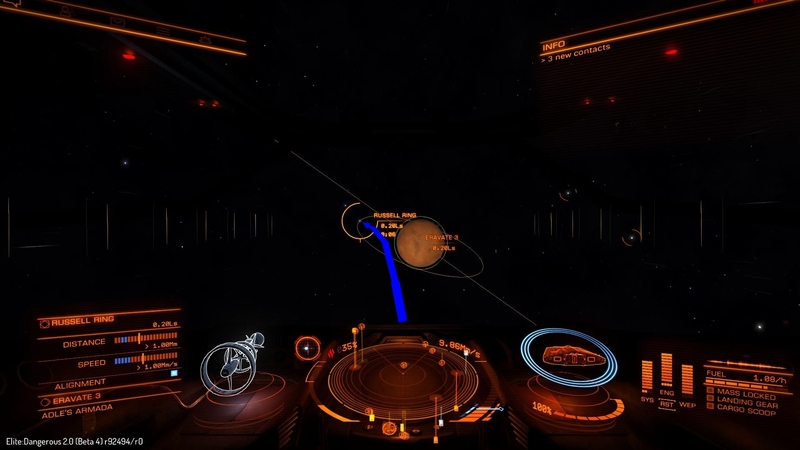 It is always possible to force this exit by pressing twice the supercruise/jump – But you will take some damage depending on your speed and also damage your FSD. Once close to the station, at a minimum of 7.5km, ask for landing thanks to the left hand panel, Contact, Russel Ring, request for landing. 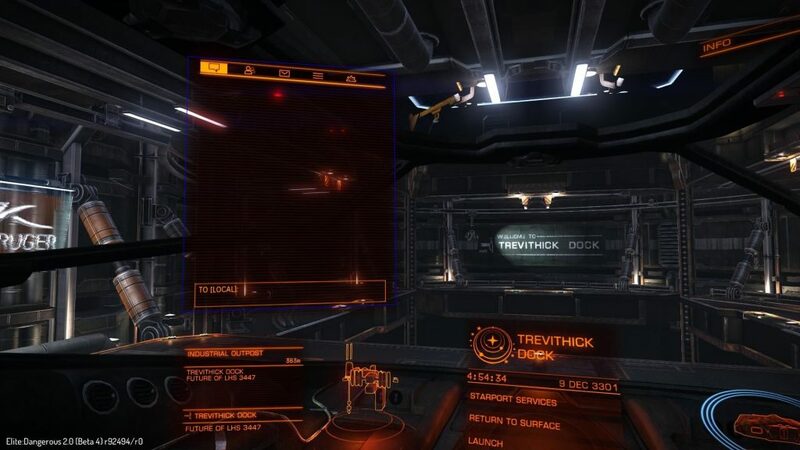 You will have a limited time, still quite long, to dock at the assigned location. 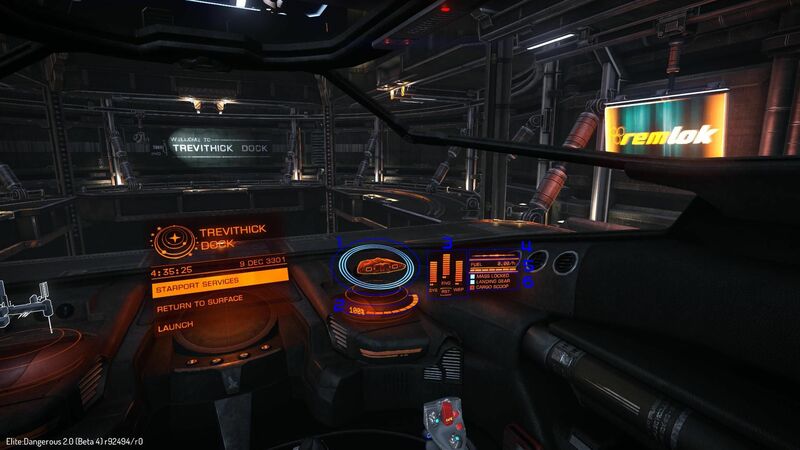 Enter the station with the green lights to your right, at less than 100 m/s to avoid any fine, and then follow your navigation indicator to find the location’s number. 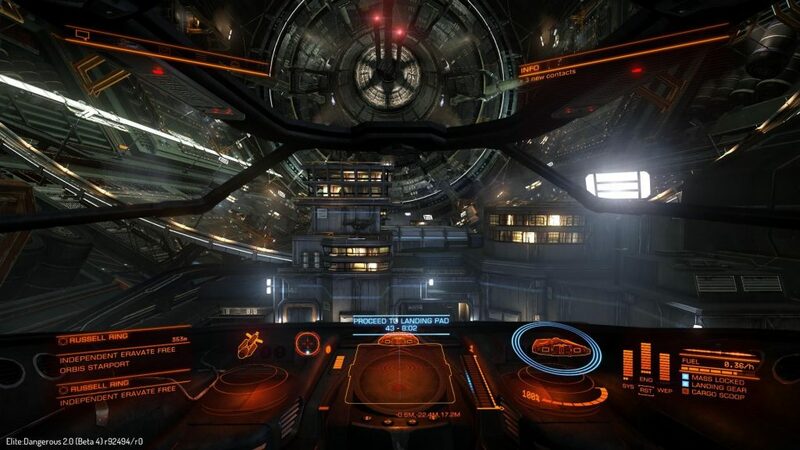 Deploy the landing gear, slow down and place yourself in the center of the pad so that the indicator turns blue. Bravo, you are docked! Go into the hangar then check the station’s services. 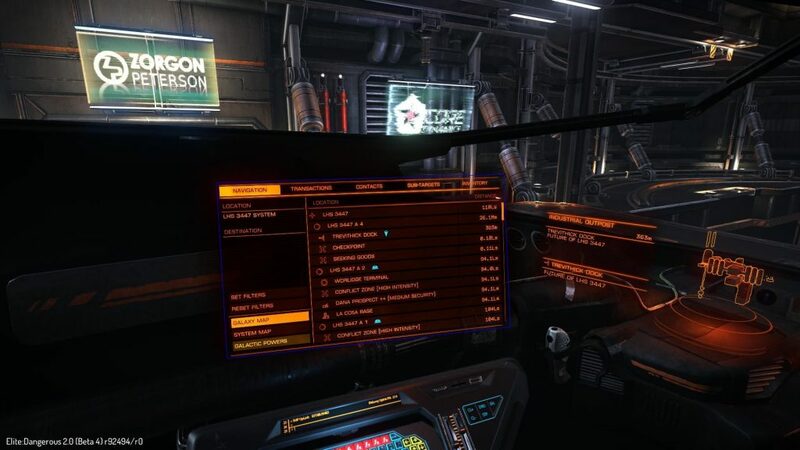 Here you can replenish ammunition and refuel your ship, repair it, check the missions board, discuss with authorities and manage your bounties and fines, equip your ship, buy other ships at the shipyard, sell or buy commodities at the market or even sell your exploration data. I suggest you start with some missions – simple transport or a wee fight. 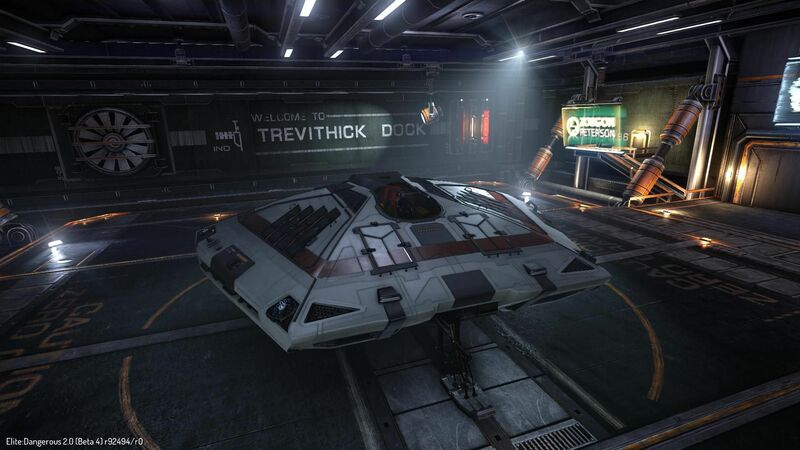 To kick it off, it is advisable to go to a nearby station with your Sidewinder. Here you will find missions that might interest you depending on your gameplay. These missions are renewed every fifteen minutes-ish. Fight pirates, search for rare and lost artworks, transport canisters from one system to another, in short… earn your first credits with easy missions! 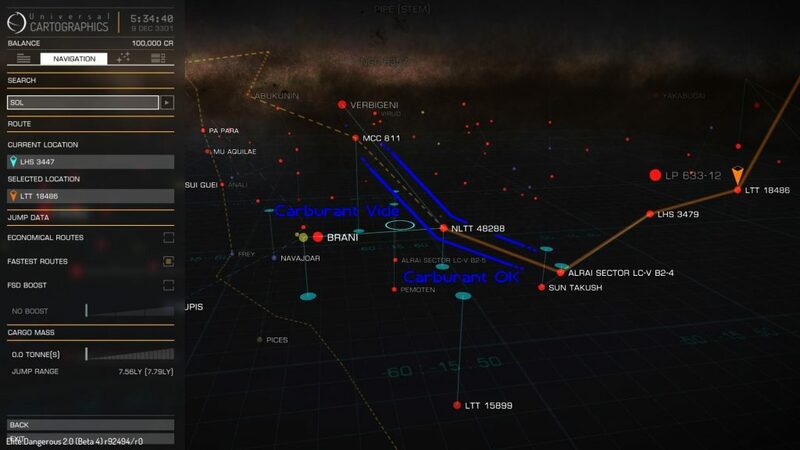 Read well the details, go to the point indicated using the galaxy map, fly to your destination and do the thing! There are many different missions, read well what they ask you to do, avoid those that ask you to kill authorities for example; Same for the assassination missions, far too harsh for beginners. Be weary of the missions with a skull, they are about illegal stuff. 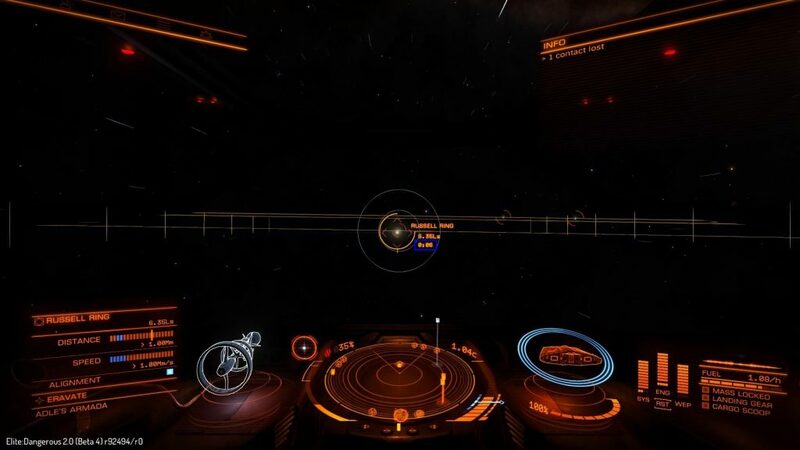 Take an interesting mission or multiple if you are confident enough, prepare your jump to the targeted system, get out of the station, retract your landing gear, aim for the targeted system on your navigation indicator and then activate the hyperspace. Here you are! 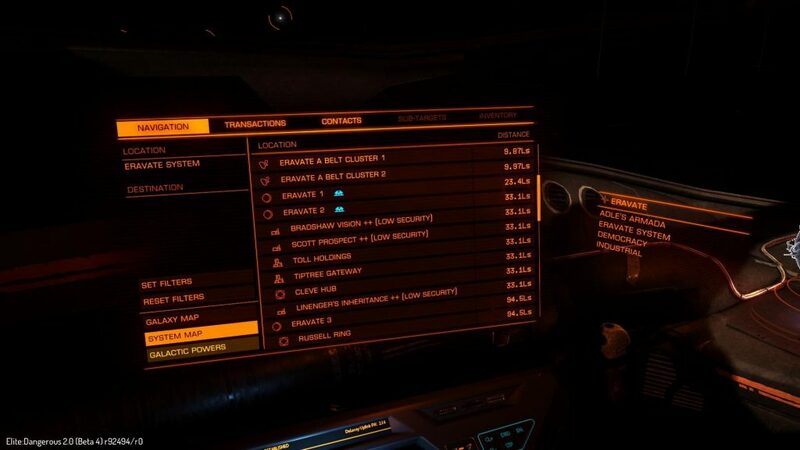 Unfortunately, it is not possible to process mining right now (not enough money for the refinery + mining laser), neither bounty hunting (Sidewinder too weak) nor trade (sidewinder with only 4 units cargo), nor nothing. You better earn your first credits with missions in order to buy a better ship that will allow some specialisation or a tougher/bigger one. I advise you to choose a system and to stay in the same station in order to build your reputation. The more reputation you have, the better the missions will be. Once you have completed various missions, there will surely be a type of gameplay you enjoyed most. 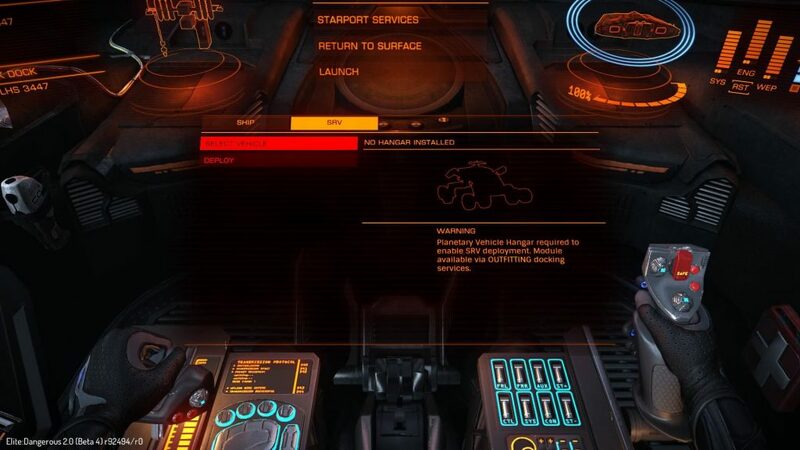 In Elite: Dangerous, all ships can be used for all roles… but some are more effective than others for a specific role. 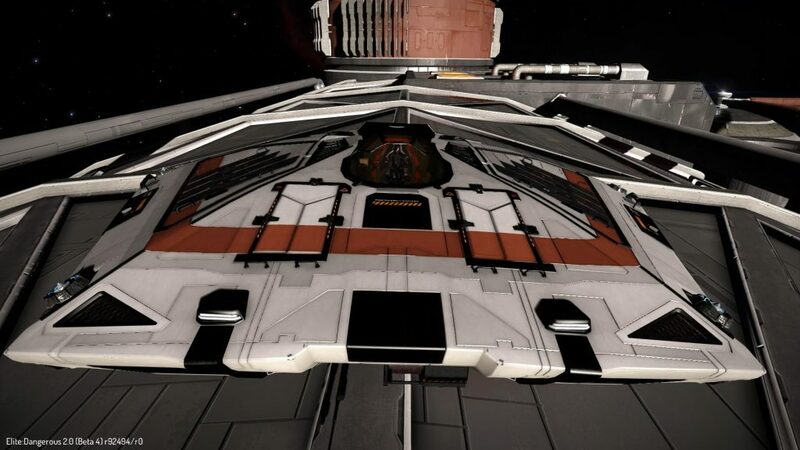 As soon as you have a few credits, buy an Adder (multi-role), a Hauler (Transport/Explo) or an Eagle (Combat) then continue to carry out missions with this new gameplay/ship. 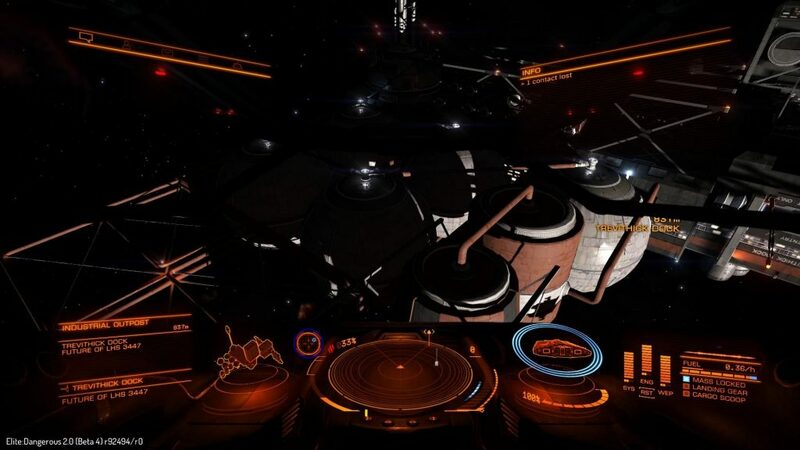 Soon, you will be able to go near the planets’ rings in order to hunt the possible pirates harassing the miners in the extraction zones, or venture in the unknown signals that you can find everywhere in space, look for fugitives near beacons, respond to distress signals from other ships, replenish the ships in need of fuel, enter low-intensity conflict zones, establish your own trade route, find your own asteroids field to extract a maximum of metals and minerals, … in short, with a little experience thanks to the missions, you will know where to earn the most credits and play the style you prefer! 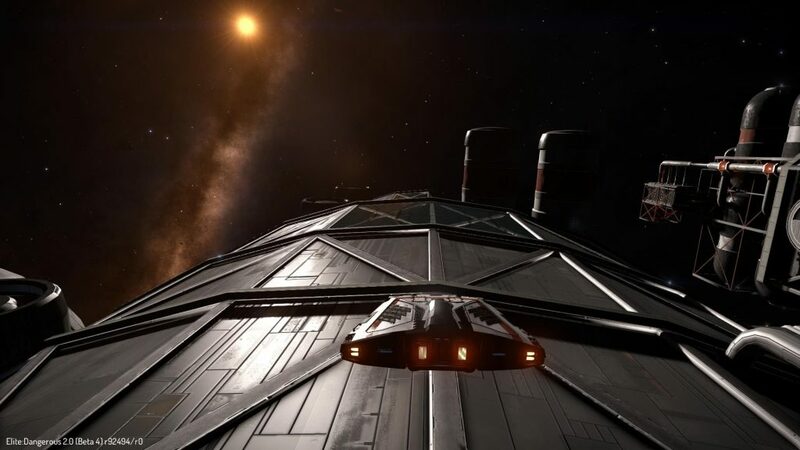 The missions are providing you with reputation to minor factions and major factions (Alliance, Empire, Federation). While the minor factions can provide you with better missions, the latter (but Alliance) can provide you with special ranks and unlock systems permits & new ships! 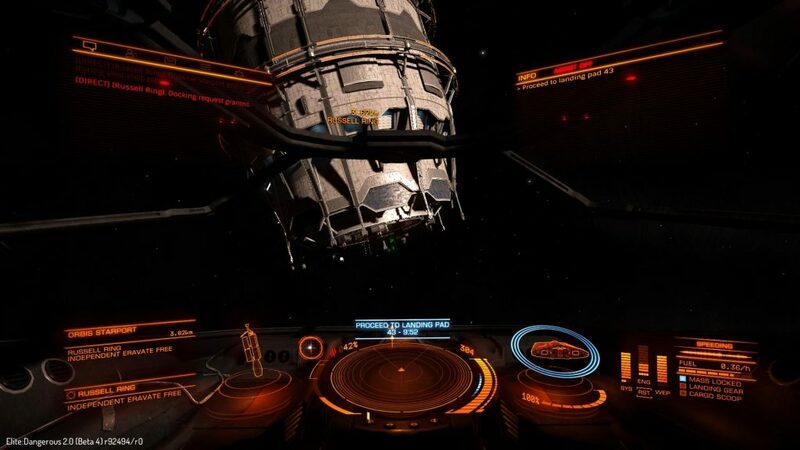 Another ship might try to attempt an interdiction on your ship. 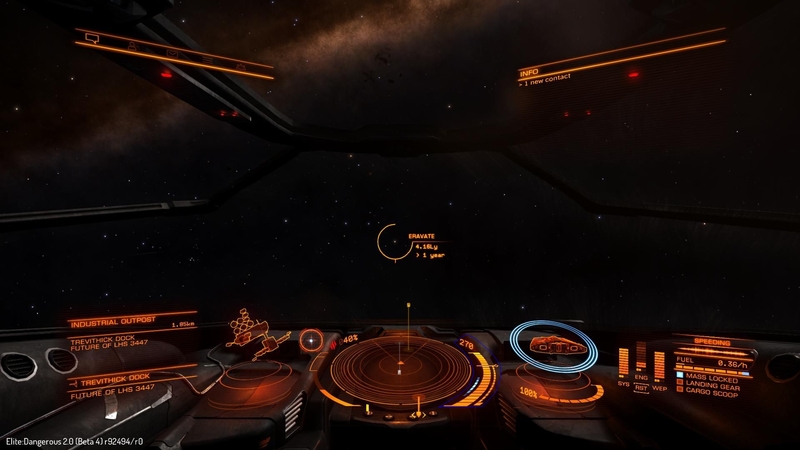 With the right module, it is possible for you to force a ship to leave Supercruise. 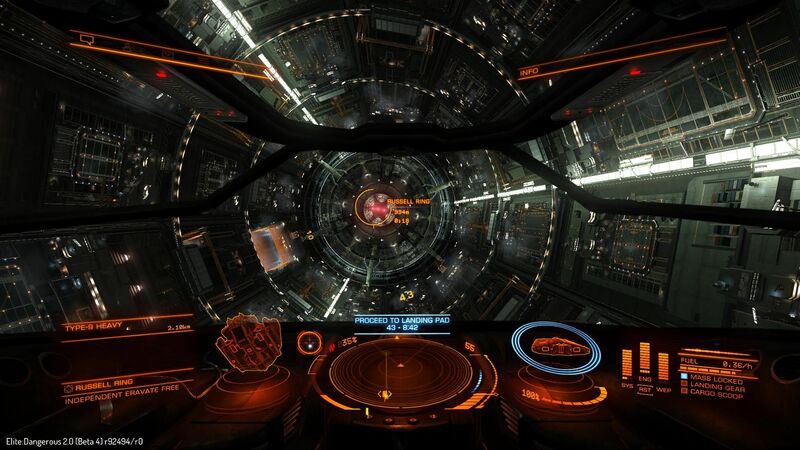 First, if an NPC interdicts you, it means that you are wanted, enemy or that a pirate is interested in your cargo. It is better for you to pay your fines and travel without cargo if possible. 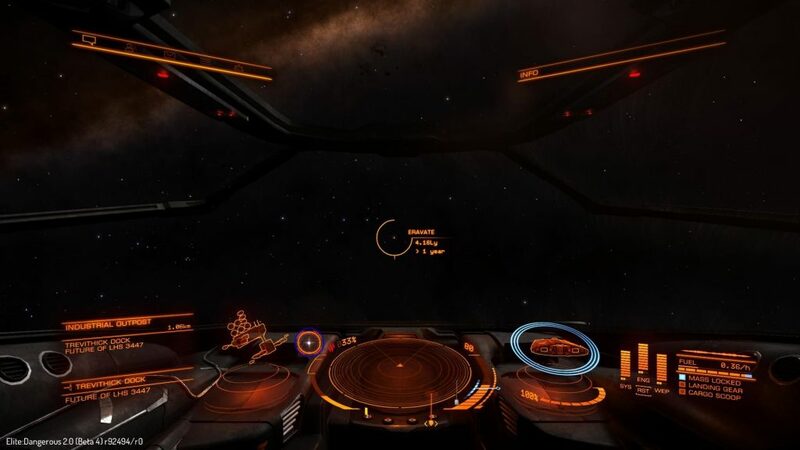 Remember, set your speed to 75%, full power to engines and aim at the center of the blue circle. 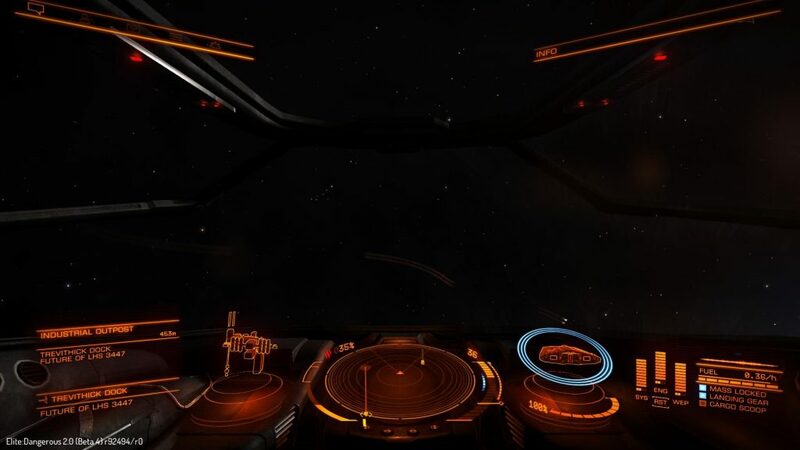 If you think you will fail the interdiction mini-game, cut your engines. 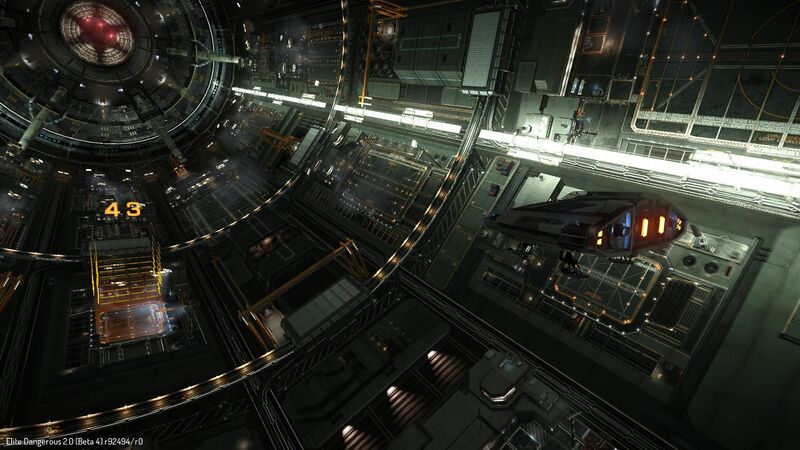 Doing so will reboot your FSD quicker than if you are caught with a full fail – so you can escape rapidly. Do not panic ! Panic leads to stress, stress leads to error, error leads to destruction of your ship. 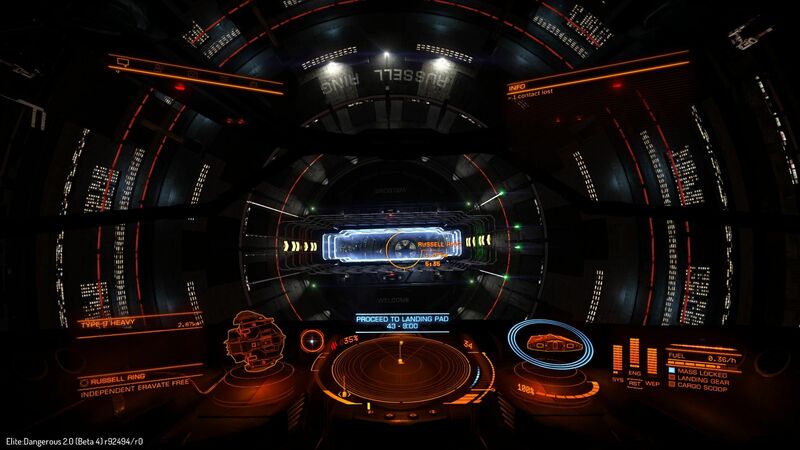 When you exit supercruise after an interdiction, analyse your offender: NPC or player? What ship? If the ship is much slower than yours: Max power in the engines, launch chaff, boost and jump quickly in another system (it’s faster than in the same system)! If the ship is faster than yours, it’s over but no panic. If it’s a NPC, full thrusters, and run while spinning + chaff. A player, listen to her/him and execute her/his demands, maybe a pirate asking for some resources. The pirates earn their living like this and do not steal all the cargo or even kill their “prey”. If a player attacks you without speaking, run or attack; It is quite rare but trolls exist… or maybe you are part of a powerplay Power and you are on her/his territory. 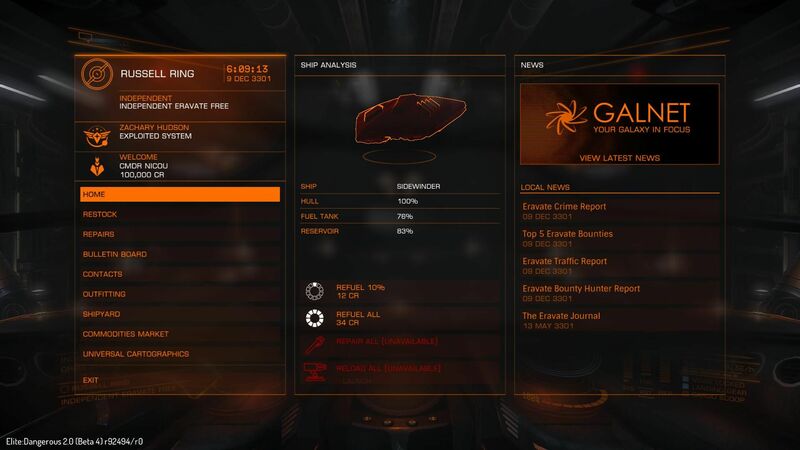 Follow us on Twitter RemlokEN and never miss any new guides, tricks and news about Elite: Dangerous!